Every sailboat needs a Sail Repair Kit aboard! 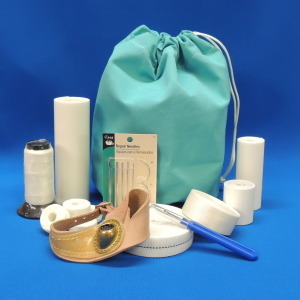 Includes everything you need for whipping lines, replacing sewn-on hanks or slides and emergency sail or canvas repairs. Kit consists of: 1 adjustable sailmaker's palm, 5 pre-waxed sail twine bobbins, 1 pack of 7 repair needles, 1 1 oz. spool V-92 thread, 15' 2" wide Dacron sail repair tape, 15' 1" flat nylon webbing, 15' 1" tubular webbing, 15' 4" 5 oz. Dacron sailcloth, 15' 4" wide 8 oz. Dacron sailcloth, 1 seam ripper, 1 ditty bag. Please indicate your ditty bag color preference in the "Comments" section, and we will try to accommodate your request. Good product, quick delivery. Thanks! The kit was the most extensive one I could find online. Awesome starter kit which included more than any other offer I could find. Thank you sailmakersupply!! The skittles that came with my order were a nice touch too! Great kit comes with a nice bag for a reasonable price. It arrived quickly. The only improvement I wish was included would be a sail repair guide with stitching techniques. Received everything as expected. Great kit. I am happy with the whole process of ordering and receiving. Thank you! Researched a lot of kits on the web and found this one to be the best bang for the buck. Quality materials, great price.